As you probably heard, we had a kid! 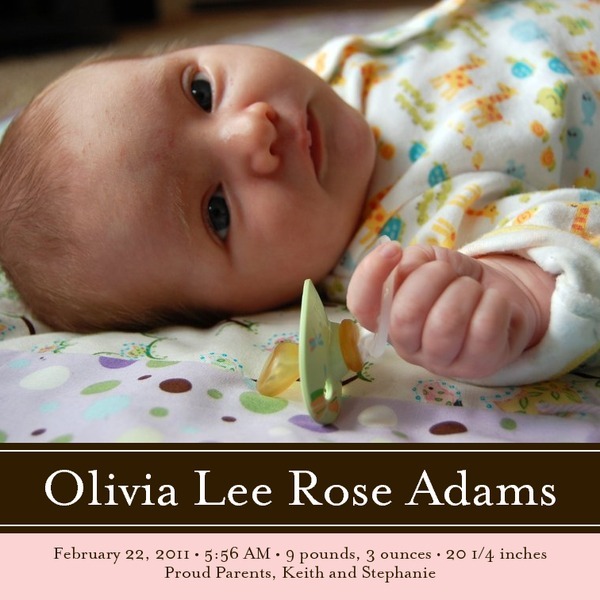 Olivia Lee Rose Adams was born February 22 at 5:56 AM. She was 9 pounds 3 ounces and 20 1/4 inches. At her two week appointment she had already gained 12 ounces from her birth weight. Stephanie and I had some leave from work to get into the swing of being parents. Olivia has made good progress in training us to do her bidding and Stephanie and I are both back to work now. In the past few weeks Olivia has become increasingly awake, alert, and interactive. When she smiles it isn’t always gas anymore. We’ve taken lots of photos and a few videos and continue to add more every day. We plan to teach Olivia sign language to enable her to communicate before she begins talking. We’re starting out with a few basic words like milk, more, change, Mom, Dad, Grandpa, Grandma, Aunt, and Uncle.